Documents published as part of the International English Spelling Conference (2018) are located here. Three versions of a famous spelling reform spoof, and the well-known Cmabrigde 'research'. The papers from the Conferences were published in Bulletins, Journals and online. A Bibliography of significant articles across all publications. Some of the main Reform Efforts 1875 to 2000, and over 7 centuries. Spelling and Parliament items from the Publications. Any questions concerning the submission process should be sent to the Congress Secretariat: spellconf.pss@gmail.com. Three versions of a spoof on graduated English spelling reform, Meihem in ce Klasrum, Linguistic Congruence within the European Union, and The New Governor's Plan, and also the spoof Cmabrigde 'research' about letter order within words. Many poems have been published in the media, showing the absurdity of English spelling. Several were included in the Bulletins. The Classic Concordance of Cacographic Chaos by Gerard Nolst Trenité were researched by Christopher Upward and published in full in Simplified Spelling Society Journal 17. Proceedings of the seventh TESS International Conference held at Coventry University as Spelcon 2008. The papers were published on-line as SSS Journal 34. Proceedings of the sixth TESS International conference held at the University of Mannheim, Germany as Spelcon 2005. The papers were intended to be SSS Journal 33, but were only circulated to members, in draft form by e-mail. Proceedings of the fifth TESS International Conference held at Aston University in Birmingham in 1987. The papers were published in SSS Journals. Proceedings of the fourth TESS International Conference held at the University of Southampton in 1985. The papers were published in the SSS journals. Proceedings of the third TESS International Conference held at the University of Edinburgh in 1981.The papers were published in Spelling Progress Bulletins. Proceedings of the second TESS International Conference held at Nene College in Northampton in 1979. The articles were published in Spelling Progress Bulletins. Proceedings of the first TESS International Conference held at the College of All Saints, London in 1975. They were published in a book, which is no longer available, but a few articles were included in the Spelling Progress Bulletins, published in the United States of America..
A list of papers delivered to the various conferences organised by the Society. A list of authors whose papers were delivered at various Conferences organised by the Society. 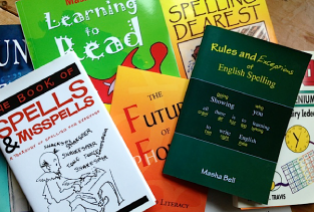 Journal 30 included a bibliography of significant articles drawn from Newsletters, Journals and Bulletins by Cornell Kimball, entitled Spelling reform: a bibliography of resources. It includes quotations, and links to the full articles. This account was compiled by TESS member, Cornell Kimball. Being American, he included many references to activities in the U.S. There is also a brief account of reform efforts over 7 centuries by Elsie Oakensen. Here are Society publications of contact with the UK government. 1. Spelling and Parliament by William Reed, giving a history, with particular reference to the 1933 petition, signed by thousands of supporters (as listed in a Pamphlet). 2. The SSS submission to the Kingman Committee 1987. 3. A House of Lords debate in 1987. 4. A House of Lords debate in 1995.